Mechanisms for overcoming semantic heterogeneity in diverse information sources are critical components of any interoperable system. In the case of diverse geographic information sources, such mechanisms present particular difficulties since the semantic structure of geographic information cannot be considered independently of its spatial structure. 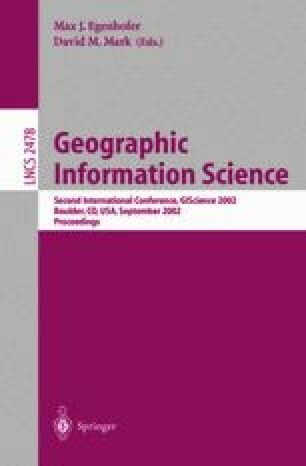 This paper develops an approach to the integration of semantically heterogeneous geographic information that is capable of addressing the spatial and thematic aspects of geographic information in concert. The approach is founded on an algebraic model of spatio-thematic information layers. Variations in the thematic structure of layers are explored, including the integration of layers with hierarchical thematic structure. The effects of changes in the thematic granularity of layers are also considered. Finally, a case study of the integration of heterogeneous land cover data is used to illustrate the relevance of the formal model within a practical application.